Situated on the Marina Promenade with indoor and outdoor seating is Elken Café. The cafe has a light airy feeling with a menu to match featuring lots of fresh juices, salads and light sandwiches. Kenan co-ownes the cafe with his wife who shares his passion for good food, with 19 years combined experience in the industry Kenen has started to develop a Gluten Free Menu driven by customer demand. The kitchen has a designated Gluten Free area and all utensils and equipment are marked with a purple colour code to minimise the risk of cross-contamination. All ingredients sourced for the dedicated Gluten Free menu are 100% gluten free however there is a caveat that states as the entire kitchen is not gluten free there cannot be a 100% guarantee that cross contamination could never occur and though the gluten free bread is baked on a set day when no other breads are being made it is in a shared oven. The open and honest approach of the Head Chef Ryan and Owner gives a feeling of confidence that they understand the needs of the gluten free community. Staff were very friendly and helpful and although the menu is still in its infancy it features sandwiches with flavourful fillings of Mexican Chicken, Pesto & Shrimp, Eggplant Caprese and Tuna & Orange. There is also a hot shrimp risotto which went down well with our party of 5. The green Tea is served with a selection of sand timers so that you can choose the strength which was a fun idea. Kenan and the head chef spent 3 months developing their gluten free bread recipe and now they feel they have perfected it they are developing their home made gluten free pasta. 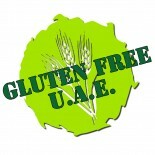 This entry was posted on 06/10/2014 by wendyallcorn in Reviews and tagged celiac, coeliac, dubai, Elken, gluten free, glutenfree, health, UAE.